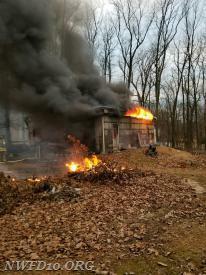 While a two alarm house fire near Mt Airy was in progress, Structure Alarm 10-14 was dispatched at 16:29, sending Engine 81 to a reported garage fire in the 3300 Block of Hooper Road. Engine 102 (New Windsor) arrived to find a 20' x 50' detached garage, well involved with exposure concerns on two sides of the building. Chief 10-1 (M. Moser) established "Hooper Road Command" and requested the remainder of a Box Alarm assignment be dispatched, as well as a Tanker Task Force. Engine/Tanker 84 was dispatched as part of the TTF. The crew from Engine 102 deployed a 2" handline and moved to protect the exposures initially, then began an exterior attack on the building. As both additional manpower and water arrived, crews placed an additional handline into service to extinguish the fire that had consumed the garage and it's contents. Crews from multiple departments worked for several hours to extinguish the fire. There were no injuries reported and the fire is under investigation by the Maryland State Fire Marshal's Office. Station 8 units returned to service at 19:24 hrs.